Three men, brave and determined men, took that final leap into a new life; complete with new titles, responsibilities, and new homes today….never to be the same again. But they prepared for this over a seven year-span, immersed in the spiritual, biblical, and examples of those around them. They definitely had the support from family and friends, and the diocese; the church was packed! This may sound very strange coming from me, but this was my first ordination. Yes, yes, I know, where have I been? What is the matter with me for not taking the time to attend such an amazing and important event as this in my Church? I have no excuse, other than the fact that it never occurred to me to attend one. This has been an experience that I will never forget. All the pomp and circumstance and ceremonial traditions were beautiful and very comforting. Our bishop was overjoyed since he had not ordained as many as 3 new priests at one time before. There was just one a few years ago and then two young men last year. Our prayers are being answered; we are growing more and more priests! My heart skipped a beat as the procession came down the aisle lead by the acolytes carrying candles, incense, and the crucifix, followed the seminarians along side the priests of the diocese. It was quite a showing, a presence, so dynamic and spiritual! 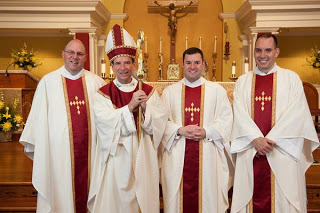 During the ceremony there were two times when all the priests present are called to show their support for these three. The first time each priest came forward and laying hands on the men individually, prayed over them. The second time they each gave them a sign of peace. This was a beautiful sign of support and approval for the ordinates. Of course their families and friends were present also, but there cannot be a more meaningful gesture than the support of those already in the frontlines. We are not alone, not one of us, and watching these three new ordinates receive the support of the priests, the Holy Spirit, and the holy saints, prostrated in front of the altar while the church sang the litany saints, it was clear to me. They made solemn promises of obedience, received great gifts from the Holy Spirit, and accepted tall responsibilities as new shepherds during this ceremony, of which, without the help and support of the Church and all of those around them, their tasks could be unbearable, if not impossible. The Catholic Church continues to grow and lead as Jesus Christ to the world and it is starkly obvious how important my role is, as a mom and wife, but also as a parishioner of a parish, and a fellow Catholic Christian along side her priests and religious. I have a responsibility to support and pray for these gentle giants in a world so cluttered with evil and darkness. There is no other way to say this but, if WE don’t take care of these men and women, who will. They are rarely thanked, ignored, and just simply taken for granted. If we don’t have priests, we don’t have a Church! If we don’t have a Church, we don’t have the support of the sacraments to keep us on the path to righteousness and glory.